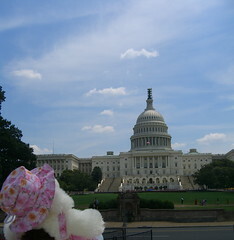 We took a trip into DC today to see a couple little things that I’ve been wanting to see. 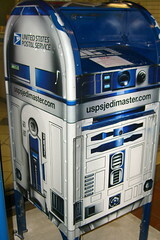 First on our list was an R2-D2 mailbox. I’d heard rumor that there was on at L’Enphant Plaza, so our first stop was there. Sadly, we walked all around that area and couldn’t find it. It may well still be there, but I didn’t have any better directions, so we gave up. We trekked up to the main DC post office near Union Station from there, stopping along the way for Jo to take a look at the Capitol. We did stop at a shop and found the 5 best motorcycle jackets ever, but alas we didn’t come for that so we left empty handed. There was some kind of police event downtown, as we saw bunches of police cars and motorcycles on the Mall. And the police cars were from many non-DC-area jurisdictions. And it was there! Cute as everything! Andrew had even saved one of our outgoing pieces of mail so I could mail it from there. He took a picture, but hasn’t uploaded them yet. 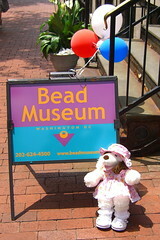 From there (and after lunch), we went to the Bead Museum. We’d tried to get there earlier this year, when they had a Shakespeare bead exhibit, but a migraine kept us from going. (Damn migraines!) They’ve now set up and exhibit on cowrie shell beads. The museum is rather small, but then, beads are generally fairly small. There is a permanent collection tracing beads back to 12,000 BCE to the present. It’s an impressive collection, especially the beads made before modern times. On our way back to the Metro, we stumbled upon a cheese shop – Cowgirl Creamery Cheese Shop. Naturally we had to stop in, and we came home with a couple of stinky cheeses (yum! ).